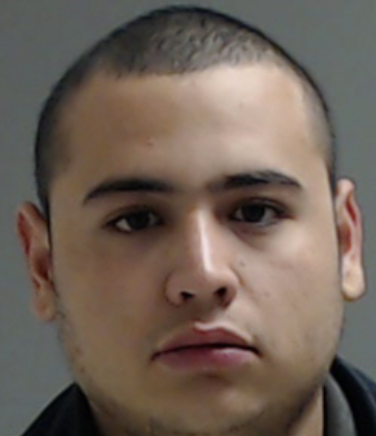 McALLEN — A 20-year-old man faces federal drug charges after nearly 100 kilos of methamphetamine was found inside his father’s tractor trailer. According to court records, Homeland Security Investigations special agents arrested Guillermo Calderon Jr. of McAllen last month after he admitted to playing a role in a meth smuggling operation. Calderon, who was already facing a misdemeanor marijuana charge in the county on a separate incident, was arrested Sept. 5 after HSI agents made contact with him in connection with the alleged drug smuggling operation. On that day, authorities with U.S. Customs and Border Protection notified HSI agents that a tractor trailer bearing Mexican plates possibly had an undisclosed amount of narcotics stashed within, and that they should keep an eye on it after they allowed it to cross into the U.S., records show. HSI agents watched as the trailer parked near a commercial property near the Jackson and Juan Balli Road intersection. The driver of the tractor trailer told officers that he was hired by Calderon to drive it into the U.S. from Mexico and that Calderon was supposed to pay him at the location on Jackson Road, but that Calderon was not around. “During a search, a police K-9 alerted to the presence of narcotics near the rear tires of the trailer,” the complaint states. To the agent’s surprise, while officers spoke with the driver of the tractor trailer, a vehicle carrying several people pulled up near the scene but then immediately left, prompting the driver to identify the vehicle as the one that was supposed to pay him for the drop. Officers followed the vehicle, a Buick Enclave, and initiated a traffic stop where they found Calderon in the back seat. Calderon was also found in possession of keys to the property where the trailer was parked — a search of that property did not turn up any narcotics, according to the complaint. During an interview with federal agents, Calderon said in previous instances the driver from Mexico would park at the same location, Calderon would then open the gate and then move the trailer onto the property. Then he would call a driver on the U.S. side to transfer the drugs from the Mexican trailer to a U.S. trailer — the U.S. trailer transports the drugs up north and then it returns with bulk cash a few days later, the complaint states. A total of 90.5 kilos of methamphetamine was discovered inside the trailer’s rear tires. Calderon, who made his initial court appearance on Sept. 11, is scheduled to be formally arraigned Thursday before U.S. Magistrate Peter E. Ormsby, according to court records. If convicted of federal drug conspiracy and aiding and abetting charges, Calderon could face up to 40 years in federal prison.